There aren’t any national or international scientific societies disputing the conclusion that most of the warming since 1950 is very likely to be due to human emissions of greenhouse gases, though a few are non-committal. [RH] Fixed the few super long URL's that were breaking the page formatting. 2) Natural convection has been well established to obey certain rules for all gases (monatomic, diatomic etc). For air, at 300 deg. K it effectively doubles the conductivity values established in 1 above. 3) Forced convection - the situation at the earth's surface - is where I make an informed guess. My old car boils if left idling for ten minutes with the fan off, at 30 mph, where the engine is dissipating at least ten times the energy, it is as cool as a cucumber. Perhaps the average wind at the earth's surface is less, but to bend over as far backwards as possible in favour of the GG fanatics, lets say it multiplies cooling by a factor of five rather than ten. That means, as my experience as a designer, builder and operator of cryostats taking temperature down to within a degree of absolute zero tells me, the proportion of heat energy radiating from the earth's surface is one two hundredth of the loss by kinetic transfer into atmospheric gases. 4) Of this small proportion an even smaller proportion of the spectrum will find molecules with which to resonate. Whether the excited molecule simply exchanges energy with the surface or suffers a collision transfering to kinetic energy is neither here nor there, because the upshot is it will make an immaterial difference to the total energy transfer. 5) Contrast this with the situation at the edge of space where very hot molecules become ionised and each and every single one of them that moves then becomes a e/m radiator losing its kinetic energy in the process. This is where the business of transforming kinetic into radiant energy takes place, it is the lower world's ultimate heat sink. We inhabit the coolant of an enclosed air-cooled machine, the heat source, the sun (and man), the heat sinks comprise moving media - the oceans - the poles and the unlit side of the earth. But, there must be another sink which provides a route out by radiation. Just as the sun's surface temperature determines the solar spectrum, so does the surface skin - the upper atmosphere ionised shell- of the atmosphere. Given the cornucopia of errors associated with the diminishing returns of surface generated radiation, I'm not sure I trust the 30% of solar energy said to be reflected, it might well be more as the ionic activity seems never to have been worked out and this would affect the calibration. In that case, the proportion participating in the earth's climate system is correspondingly less. That makes man's additional energy input of 5x10^20 joules p.a., and increasing, all the more serious. No wonder there is a push to claw this energy back out by windfarms - I think the real physicists around know that carbon driven AGW is bunkum. The villain is conspicuous energy generation by mankind and who wants to admit that? Lets hope the mechanism radiating from earth doesn't get too far behind events lower down and let atmospheric vigour get too out of hand. [TD] As Tom Curtis pointed out, your comment is entirely off topic for this thread. One of the great values of the Skeptical Science site is its division of information into fairly tidy themes so that it is easy for people to find the information they want. For your main argument, it is necessary for you to post your comments on other threads, the best one being the one Tom Curtis pointed you to. Regarding your contention that waste heat is responsible for most of the warming, read and then comment on the post It's Waste Heat. 1) Your description of how the atmospheric greenhouse effect works is inaccurate; and the inaccuracy means your argument against it is a strawman. 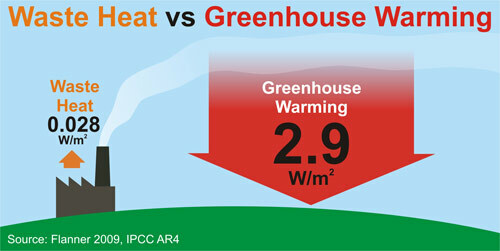 2) Heat transfer by convection is taken into account in models of the greenhouse effect, and have been since 1964. They work out numerically the actual effect of convective heat transfer on surface tempertures, wereas your "calculation" consists of mere handwaving. Your criticism is therefore (at best) 39 years out of date. 3) The impact of CO2 on Outgoing Longwave Radiation (OLR) has been predicted by Line by Line Radiation models with extraordinary accuraccy and observed from space. That CO2 reduces the OLR in the frequencies at which it absorbs is, therefore, beyond doubt. On pain of violating the first law of thermodynamics, it follows that at other frequencies the OLR must be increased to compensate, and the only way to do that is to have a higher surface temperature. Tom, time flies. Old Sage's argument is 49 years out of date. Old Sage, I encourage you to continue your discussion here on the appropriate thread, but you might--if you want to do the math--go to SoD. Questions are encouraged here as they are there. You might also note that downwelling longwave radiation has been measured against modeled projections. Studies such as this one might help you check your own work. If you're confident enough ("oh deary") in your conclusion that the greenhouse effect is insignificant with regards to climate system energy storage, you might want to publish your work. The editors of Science and Nature would probably Sumo wrestle for the right to publish the work, and the Nobel committee would obviously be on your doorstep. Also, given the money being pushed around to address AGW, I'd think you'd have a moral imperative to publicize your work at the highest levels. Finally, I'm curious. Total insolation has been flat or falling for fifty years, and before 1960 solar tracked surface temp fairly well. Yet system energy continues to accumulate quite rapidly. What's the mechanism if not the enhanced greenhouse effect? Please respond on the appropriate threads. There are plenty to choose from, and the regular posters watch the aggregate comment stream for new comments, so your responses won't be missed. I have to say, I always find it fascinating when someone like "old sage" comes here to cast off an entire body of scientific research, without even so much as referencing even one piece of research. He states that he's taking a "physicist's look" as if the 30,000+ actively publishing researchers working in this area have no background in physics. Be realistic, Old Sage. How would you respond if some climate scientist came to you and told you the physics of cryostats was all a bunch of bunkum? Those like old sage would have science re-prove the existance of the atom in every study, mayhap...or republish the above list daily, it would see. How can the greenhouse gas disciples ignore it? Because it has been weighed, it has been measured, and it has been found wanting. In other words, why obsess about the possible impact of a demonstrably small contibutor to global warming while ignoring the elephant in the room who's effect, even without feedbacks, is indisputably orders of magnitude larger? If co2 is so important, please tell me where I can look up tables of absorption of characteristic frequency radiation plotted against co2 concentration in air at various pressures and temperatures. [DB] Off-topic and sloganeering snipped. Please review this site's Comments Policy before submitting further comments (link adjacent to the Comment Box). [TD] Specifically, put this comment on the thread that Tom Curtis pointed you to--not the waste heat one. Sorry folks, only joined this yesterday and not got the hang of it, will try to shift msgs! My wife's good friend teaches 6th grade in San Diego, California. A few days ago she told me she covers "global warming" in her class but emphasizes there's no scientific consensus and explained to me her understanding of the issue, which basically mimics the fox news disinfo. She's otherwise a liberal-minded person. She's actually teaching the disinfo to her 6th grade classes and has been for years. I rebutted her misconceptions but she had read a lot of bad info on the subject and wasn't receptive to my points over dinner. She let me install the Skeptical Science app on her iPhone, though. My point in posting here is that I'm alarmed that school teachers are spreading misconceptions in the guise of preaching "both sides of the issue because every issue has two sides," as if both sides are correct or unprovable or convincing. Some global climate change group needs talk to teachers in the san diego public school system. I am glad you brought up this point. As a public school teacher I can attest to the notion that the disinformation swirling around global warming and climate change is happening at my high school in Michigan. A science teacher at my school shows his students “The Great Global Warming Swindle” and not for the purposes of demonstrating the use of propaganda. Although I do not teach in the science curriculum, I do teach U.S. Government and Politics and I am privy to the forces unleashed upon teachers regarding these issues. The “teach the controversy” phenomenon, pushed by the Heartland Institute, et al, is alive and well and is straight out of the tobacco industry playbook to “deny the science” and manufacture doubt”. I am sure you are aware of the book Merchants of Doubt by Naomi Oreskes which does a nice job of explaining the tobacco industry's playbook which is currently in use by the fossil fuel industry. I'm new here and I'm trying to get to the right subject--consensus. Anyway, you bring up tobacco in apparent reference to disease and propaganda. Yes, the tobacco industries desperately avoided getting saddled and hired the best--the absolute best--attorneys available to slip the noose. They failed because the statistics are so obvious. The chance of developing bronchogenic carcinoma [for one] is 10 times greater in smokers than in non-smokers. [DB] Off-topic, sloganeering, inflammatory and ideology snipped. OK, DB, so I'll give it another shot. My comment is strictly on topic. --Usage. The expression "consensus of opinion" is sometimes criticized as being redundant on the basis that "consensus" alone conveys the meaning. Although the redundancy argument is weakened if "consensus" is taken in its earlier and valid sense of "general agreement or concord," the criticism of this phrase has been so persistent that "consensus of opinion" occurs only infrequently in edited formal writing. The phrase "general consensus" is also objected to as redundant. Now, Spoonie will comment. Using the strict definition of the word "consensus", it can certainly be argued that there is no consensus concerning AGW theory. There is no "solidarity of opinion". There is little "concord" and there definitely is no "harmony." Seriously spoonie? You don't think there's a consensus on the theory of the enhanced greenhouse effect? That's all AGW is, plus the proposition that humans are responsible for the rapid increase in atmospheric CO2. You realize that there are no comprehensive alternative theories and that the climate of the past cannot be explained without resorting to the greenhouse effect (and of course the GHE has been directly measured from surface). Or is it that you're being imprecise in your complaint/claim? There are of course many who would say that science is always in flux so there can never be a scientific consensus. This is perhaps theoretically true, and perhaps more than theoretically. In a recent BBC radio interview Prof Joanna Haigh suggested that if you put a bunch of professors in a room together, the last thing they are going to do is agree with each other. As a profession, academics make their mark in the world by arguing with each other; arguing and winning. Thus Professor Haigh's point is that the AGW consensus is all the more powerful because the IPCC has actually managed to bash academia into singing off the same hymn sheet. Using your dictionary definitions, you are probably correct to say there is no "solidarity of opinion" concerning AGW. Or at least it is fragile. Them professors will soon start arguing if you let them. But your dictionary also describes "collective judgement or belief" as being consensus. I think that has been achieved. AGW is real and it is bad, potentially exceedingly bad. And with the dissenting 3% entirely disagreeing with each other as to what the consensus has got wrong in reaching such a judgement, the "collective judgement" looks even better grounded. Good. I believe you understand that, while tight definitions are important, "consensus" is not a particularly tight concept. I believe the term "consensus" has been used and misused because most folks--not even climatologists--can be pinned right on the mark by it. The word is nebulous and, in my opinion, shouldn't be used in polite conversation. Still, a lot of AGW folks, live and die by the word. but many likely never bothered to look it up in the dictionary. Still, Dan Bailey, is surely right. I need a few remedial classes in scientific....ah....consensus, and a little light reading wouldn't hurt, either. And, DSL, your post is intelligent but slightly off topic [which I don't mind]. I believe that most climatologists do believe in the theory of enhanced greenhouse effect [who doesn't?] but I'd stay away from the word "consensus." I'd love to address the rest of your post but DB doesn't want me to veer from the true path. [JMH] You are skating on the thin ice of excessive repetition and sloganeering -- both of which are prohibited by the SkS Comment Policy. Please cease and desist or face the consequences. Chuckle, "AGW folk" is more ambiguous than "consensus." How do you define "AGW folk"? I'll tell you what a consensus is. It's achieved when science moves on, when science stops targeting the proposition for testing. Very rarely, and the probability weakens with each passing year, do major theories that have reached the consensus state end up dying or going through major revision. Science has moved well beyond the fundamental theory of the greenhouse effect. Its existence is no longer being targeted for research. It is instead now fodder for STEM undergrads. The fine details are still being worked out, yes (radiative transfer is not a simple thing). Sure, there are the Gerlich & Tscheuschners of the world, who attempt to mathturbate the effect away, ignoring the multitude of direct surface observations (not surface temp -- downwelling longwave radiation from the atmosphere) that confirm modeled expectations. You can try to defend them if you wish, but their existence falsifies the consensus of evidence in favor of the greenhouse effect no more than the latest nutjob moon landing hoax claim falsifies the theory that humans have been to the moon. Again, without solid evidence and a coherent physical model, it's all lip-flapping and dancing with the general public, singing sweet nothings down the ear canals of those who have not the time, energy, training, means, and/or motivation to engage the actual science. Is Cook et al. 2013 lip-flapping? Perhaps, but you won't find too many scientists disagreeing with the conslusions drawn. You can wheedle and whittle all day with Anthony Watts, but the 600k pound gorilla in the room is 1) that the basic theory is supported by all evidence and physics, and 2) that there is no alternative theory that is supported by all evidence and physics--not even close. And if the theory is the actuality, then global energy storage can only continue to rise in the absence of any major off-setting forcing. Spoonieduck... Perhaps you can share with us what you believe the word "consensus" means. I've always understood it to mean "a general agreement." It doesn't mean that absolutely everyone has the exact understanding about an issue. I would suggest that research shows there is a "broad" consensus on nearly all the basic tennets of AGW. Science is, by its very nature, battlesome since it is constantly operating at the boundarlies of our understanding. The fights are over what we don't yet know. And they tend to be fierce and highly intellectual battles that are well beyond anyone who doesn't have a deep education in the particular subject. The emphasis on scientific consensus (the broad agreement within researchers actually doing the research) is that is what should guide public policy. It might turn out later that the consensus was wrong but the right decision for policy makers is go with the consensus. When stakes are high it is plumb foolish to do otherwise. Would you agree that policy makers should be mobilising resources if science said 75% chance of devastating asteroid strike - or wait till you have certainty but its too late to do anything meaningful.? Best not to ask for definitions from Spoonieduck. It is evident from what Spoonieduck says that the meaning of the word "consensus" is not the issue here as it is dismissed as being "nebulous." There is also the complain that it is misused which is perhaps an interesting idea given the word is apparently so ill-defined. Spoonieduck is evidntly hostile to its use, certainly with regard to AGW. I would suggest it is better to ask Spoonieduck what is meant by "There is little "concord" and there definitely is no "harmony" (concerning AGW theory." I though I was contradicting this statement when I wrote @566 that folk were "singing off the same hymn sheet." Spoonieduck's undoubted objections to this 'singing' are likely not to do with the quality of the voices but rather the actual song being sung. The nations of the world go over the IPCC summary document word by word and agree with all of them (for the fourth IPCC report the Bush administration agreed with the executive summary). How could you possibly have a greater consensus than that? Consensus does not mean unanimous agreement, it means the great majority agree. In this case, unanimity of nations is required, which is beyond consensus. You are correct in assuming that my objection to the word "consensus" is individual and, even to me, my belaboring of the subject quickly becomes tedious. Hi all, I chanced upon this site looking for some condensed evidence into AGW. I'm not a climate scientist though I have a good basis in science. My main issue is that most things I read essentially say "climate change is happening therefore we must tackle man-made climate change" without making the link between climate-change and man-made climate change. The headline for this page is "97% of climate scientists endorse AGW", and yet reading the small print this seems not to be the case. It seems some feel that to be a skeptic you have to reject AGW as possible. This would then suggest there were only about 1% of papers that were skeptical. In fact, skeptical means you feel the evidence has not proved the issue one way or the other. In the abstract study, only 32% of the 12000 papers endorsed AGW. 1% rejected. This leaves 67% skeptical. One of the problems with the wording of this article says the papers will be segregated into various categories, but it doesn't state whether the "no position" category means "we cannot endorse or reject AGW based on the evidence in this paper" or if it means "we just haven't mentioned endorsing or rejecting AGW". Stating "we are taking no position in the matter" is very different to just not talking about it in the first place. The Self-rated section helps a little but still the "no position" problem is evident. Did the authors write "I take no position with regards to endorsing or refuting AGW" or did they just leave the section blank? So, am I missing something in the numbers? What % of authors stated "no position" versus the % that just didn't mention it at all? Am not intending to flame, or dismiss this study, but currently this study says to me 35% of climate scientists are skeptics. Mytheroo... My first question for you would be, have you read the entire paper yet? Mytheroo.... You can think of it this way: How many research papers that relate to evolution are going to state a position on whether evolution is real or not? The more accepted the basic science is, the less papers are going to actually express a position. Thus, Cook et al is saying, of the papers that do state a position, 97% accept man-made global warming. So, using your terminology, 1.8% of authors of rated papers published papers which are "skeptical", with 25% of those authors publishing skeptical papers which are agnostic, while 75% published skeptical papers which rejected AGW. 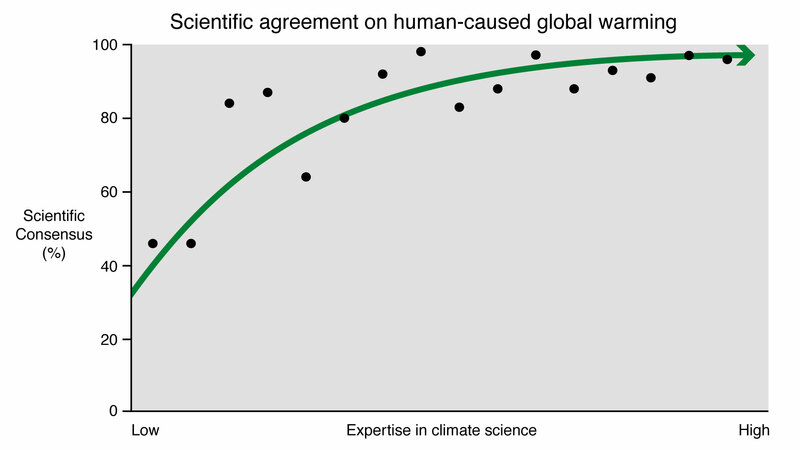 Those percentages do not directly translate into percentages of the climate scientist population holding particular opinions as some authors published both papers rated as endorsing, and papers rated as neutral. There is no contradiction in that in that authors opinions may have changed over time, and papers deal with only a small subset of the data, so that an author may in one paper say that a particular subset shows AGW to be true, while in another paper say that the seperate data does not support a conclusive decision. It's also worth noting (once again, since people seem to so easily miss this important point) that Cook et al is not a survey of scientists' opinions. It is a survey of the positions expressed in the research papers. You want to see consensus? I think this is pretty much the definition of consensus! ALL OF THESE Organizations below have independently concured in formal statements (linked at bottom) that CLIMATE CHANGE IS REAL! Since 2001 34 national science academies, three regional academies, and both the international InterAcademy Council and International Council of Academies of Engineering and Technological Sciences have made formal declarations confirming human induced global warming and urging nations to reduce emissions of greenhouse gases. The 34 national science academy statements include 33 who have signed joint science academy statements and one individual declaration by the Polish Academy of Sciences in 2007. *American Institute of Biological Sciences. *United States: National Academy of Sciences (NAS), the National Academy of Engineering (NAE), the Institute of Medicine (IOM), and the National Research Council (NRC). Having now read the entire survey, a question arises whereby the 97% figure eventuated, I was wondering why there wasn't a 100% agreement of the 32.6% of abstracts that thought humans influenced climate? Also the 66.4% of the 11944 abstracts looked at, that expressed no position on AGW seem to have been dismissed out of hand. My reading of the survey of all the climate abstracts, puts the consensus on AGW at more like 33%. Why is it that the abstracts studying climate held no position, are not included in the overall result? I am genuinely mystified as how a figure of 97% endorsing AGW, when 66.4% of abstracts of 11944 held no position at all on AGW. If this too hard to explain here you can privately email me so I can have a clear understanding of what is going on. Following on 581 Steve B, I would like to know how many of the abstracts explicitly endorse that humans caused most of the global warming? From what I understand of the data, there were only 75 such abstracts. Correct me if I am wrong. I am a newbie and not terribly scientific, but I understand numbers. Would someone care to explain? Is there any hope of getting the true facts bout the mythical 97% like just how many climate scientists there are and which way they voted? 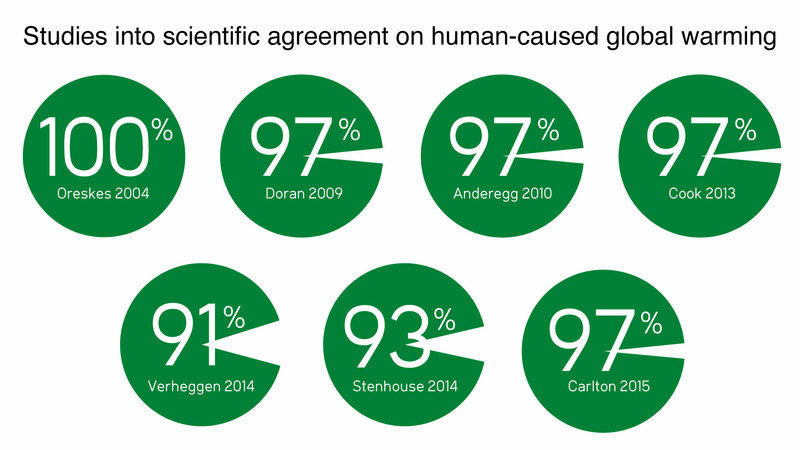 [JH] Read Skeptical Science Study Finds 97% Consensus on Human-Caused Global Warming in the Peer-Reviewed Literature. if you have further questions on this topic, post them there. Realist308 - this article is showing that the statement "that there is no scientific consensus" is false. You are entitled to believe that all those scientists could be wrong but I wonder whether you have same opinion on all those scientific theories on which there is a consensus? If your Dr tells you have x disease and the scientific consensus is that you need Y to save your life, do you go with the consensus or the crank who tells you it can fixed with magnets? @scaddenp - Unfortunately, your analogy isn't a good one. 30 years ago the consensus scientific opinion in the medical community was that stomach ulcers were caused by lifestyle and stress factors. Two "cranks", Drs. Barry Marshall and Dr. Robin Warren, postulated that bacterium H. pylori was the culprit. What was the initial reaction in the medical establishment? Castigation and excoriation. This lasted for years until both doctors were eventually exonerated by the community and went on to win the Nobel prize in medicine! Egg, meet face! The bottom line here is that consensus, in and of itself, means little in terms of correctness and accuracy. It is a weak framing of the issue because it is a defensive mechanism that allows scientists to take comfort from a "safety in numbers" approach. Invoking the "consensus shield" is anathema to science, to which healthy questioning is the lifeblood of discovery. The approach of directly debunking skeptic claims through evidenciary proof is much more effective than hiding behind consensus. I think the AGW community does itself a disservice by touting consensus as loudly and as often as it does. It detracts from the better tactic of taking the issues head-on, case by case. The day we stop questioning consensus is the day science dies. Do you not think your own analogy is itself pretty rubbish. Firstly Marshall & Warren developed they hypothesis in 1982. Twenty-three years later they had been awarded the Nobel prize for Medicine. Of the contrarian work in climatology, I see no candidate whatever worthy of any sort of award or commendation. And how long have these numpties been at it? Secondly, while Marshall & Warren fought against a consensus, that concensus was not itself wrong as people do get ulcers and stomach cancer because of stress. What the concensus was missing was that there was a microbial cause also acting. It was because 50% of humanity are infected with that microbe and the vast majority do not suffer ulcers that gave Marshall & Warren such an up-hill battle. You appear to be arguing that humanity should ignore science because there are always questions for science to answer. Such an argument is nonsense. Prosensus, you need to look at the bigger picture. Galileos are extremely rare, but crackpots are extremely common. Marshalls and Warrens are a bit less rare, but they are still way outnumbered by scientists that make bit claims that go against the scientific mainstream in their fields, but who are simply mistaken (e.g. Wakefield, Essenhigh, Salby etc.). The existence of people like Marshall and Warren illustrates that the existence of a consensus is not absolute proof of anything, but it also doesn't mean that consensus is not good evidence of something being true. You need to look at the relative frequencies of the consensus being correct and it being incorrect. Sadly the cases where the consensus is correct (e.g. Salby) tend not to go unreported. Nobody is "hiding behind consensus" (frankly that is just the sort of rhetoric we could all do without). The value of the consensus is demonstrated by the fact that the skeptic scientists keep going on about the lack of consenus, which led to papers like TCP. Science generally isn't concerned with consensus as the scientists are able to form an informed opinion on the topic for themselves. The same is not true of the general public, who don't have the scientific background to do this on every topic, which is one of the reasons we have scientific bodies such as the Royal Society, the Royal Statistical Society, the IPCC etc, which show where the mainstream scientific position lies in a way that can be appreciated by the general public. "The day we stop questioning consensus is the day science dies." this is a nice soundbite, but nothing more. If by "we" you mean the general public then the statement if obviously incorrect, science can operate perfectly well without external questioning. If "we" meant the scientists, *they* are not very interested in following the consensus, the cutting edge is where advances are made, so "questioning the consensus" is their day job. "Barry Marshall: Well, I was fairly confident at that stage, and I was sticking my neck out. Doesn't seem to me like "castigation and excoriation." He received the Warren Alpert Prize in 1994, only 8 years later, from the Australian Medical Association. Sounds more like the data was fairly checked and accepted, as you would expect for any new claim. Can you provide a cite to support your wild claim that Marshall was not treated fairly??? It would mean more if you can support your wild claims. I'm kind of curious if anyone can show that the mainstream medical science position on gastric ulcers prior to Warren & Marshall's work was anything like as well-supported by evidence or as well-endorsed by the practicing researchers of the time as the scientific consensus of global warming is today. The interview with Marshall that michael sweet linked to suggests such is not the case, which is likely another reason why the case of Helicobacter is a poor choice in attacking the scientific consensus on global warming. One of the things that happened with me is that I was interested in computers, even in 1980 with e-mail, but it was really teletypes in those days. Our library had just got a line to the National Library of Medicine. So I came in and started doing literature searches, because I was interested in computers and it was fun for me. But I started trying to track these bacteria. And I found various, very widespread, dispersed references to things in the stomach, which seemed to be related to the bacteria, going back nearly 100 years. So that we could then develop a hypothesis that these bacteria were causing some problem in the stomach, and maybe that was leading to ulcers. And then, instead of having to do 20 years of research checking out all those different angles, the research was done, but it was never connected up. And so, with the literature searching, as it became available, we were able to pick out the research that was already there and put together this coherent pattern, which linked bacteria and ulcers. It didn't happen overnight. We actually thought about it for two years before we were reasonably confident. It was really quite a few years before we were absolutely water-tight. posted a comment, did it get deleted? if so could someone point out why so I'll be able to better form future comments? [Dikran Marsupial] Your posts were indeed deleted, due to sloganeering. Please see the comments policy and adhere to it. SkS is a good forum for rational discussion of science, but rhetoric and inflamatory tone tends to be counterproductive, so please dial back the tone. OK so my original comment got deleted so I'll just go one fact at a time and see how things go. First I'm not a climate change denier, I'm skeptical of both sides particularly because so many of the key players have a profit motive. My interest here is to find out the truth based upon as much hard science as possible and not be side tracked by spin, emotionally driven or financially motivated agenda's. First, I question the message of the big red logo declaring "97% of climate papers agree that global warming is happening and we are the cause". Climate change is happening, I don't know anyone who disagrees so stating that as part of an argument tends to lend itself to the logical fallacy of false implication. The logo clearly implies that we are either the only cause or the major cause of global warming but that is definitively not what 97% of climatologist or climate papers state. The implication of the conclusion does not match the data and the fact no one on this site is addressing that fact makes the conclusion seem greatly biased. To give an example of my point, I think if you had a bunch of peer reviewed science on premature causes of death in adult males in the united states you would get 100% consensus that car crashes cause deaths. If you then made a logo that stated 100% of scientific papers agree that car crashes are THE cause of premature death in adult males in the united states would that be an accurate way to use the data? Is there a report/study of the number of climate papers or climatologists who are publicly stating that humans are the primary or sole cause of the climate change? I have done a lot of reading on this site but have not found that study. Additionally the fact it's being repeated adnauseum makes it seem like there's a conscious effort to eliminate skepticism through the use of that logical fallacy (ad nauseum) as well. Though I agree CO2 emissions do appear to have a potential causation in some of our climate change (the only fact here is correlation and real scientists know that causation and correlation are not the same) but there is lots of data that is contrary to this assertion. From 1900 until 1940 temperature was dropping despite the unmitigated rise in CO2 levels. That doesn't make a lot of sense if AGW is the major cause of global warming. bakertrg Your car based analogy is misleading because there are many causes of premature death, but there are only two possible causes of climate change, namely anthropogenic or natural (or a combination of both). If a paper takes the position that climate change is predominantly anthropogenic, that is implictly taking the position that is is (at least mostly) not a natural phenomenon. 97% of the papers that take a position on the question do take the position that it is mostly anthropogenic. The papers that do not take a position on the question (and the vast majority of papers on climate change do not) shed no light on the question and hence are not included. If you want a study of scientists that are publicly stating that humans are the primary cause of climate change, then you won't find one, because scientists have better things to do, however as a start, you could just list the names of the authors of the IPCC WG1 reports (there are a lot of them). Then you can add the authors of the statements made by the scientific bodies that Daniel Bailey mentions. As to your last paragraph, if you think that correlation is the only reason we have to think that CO2 causes climate change, you are mistaken (or at least your information is out of date by at least 70 years, the phsyical mechanism of the greenhouse effect was worked out in detail by Calendar and Plass in the 1950s and 60s). If you think that the greenhouse effect does not exist, then I suggest you read Roy Spencers list of skeptic arguments that don't hold water (in particular item #1). Climate change is happening, I don't know anyone who disagrees so stating that as part of an argument tends to lend itself to the logical fallacy of false implication. There's a TV program discussing the failure of climate-related legislation to work its way through the US Congress in 2010-2011. Sadly I do not recall the name, although I believe it is featured here on Skeptical Science. One of the spots in the program showed Christopher Monckton egging on a Tea Party rally in, if memory serves, 2010 during the run-up to the Congressional elections. If you really don't know anyone (or know of anyone) who has denied that global warming/climate change is really happening, you aren't reading enough Internet comment threads IMO. I'm skeptical of both sides particularly because so many of the key players have a profit motive. Go to your closest university with atmospheric physics department and look at the cars the scientists drive. My interest here is to find out the truth based upon as much hard science as possible and not be side tracked by spin, emotionally driven or financially motivated agenda's. Okay then, go read the IPCC AR5, or maybe the US National Climate Assessment. I'm not sure why you seem to think otherwise, but I totally agree on the CO2 being part of the greenhouse effect, my argument is the change in CO2 is not convincingly correlated to climate change on the level that is being put forth. So we're clear, everyone is in agreement that the climate is currently shifting warmer and the greenhouse effect is a real thing. The dispute is if man made emissions are causing that shift more than nature. There really is very little evidence to support the claim that it's (CO2 emissions) causing global warming on a massive scale when we're simply not experiencing global warming beyond what has repeatedly been experienced in the past. As of 2001 humans had only changed the CO2 levels by 100ppm, I'm sure it's 200 ppm or more by now (I read somewhere we're increasing the number by 2 ppm per year but forgot where), but 200ppm is a miniscule fraction of the greenhouse gases as compared to water vapor for instance. Once again if CO2 is such a sure thing for causation (not simple causation but THE significant causation) how was temperature dropping in the early 20th century despite rising CO2 levels? I fully understand the greenhouse effect, that's not the debate the debate is that the relatively small change in greenhouse gas density is massively impacting global climate and that AGW is definitively the cause of a massive change even though we're still in a place that is fully within the expected variance defined by historical record. Does that make sense? Your argument is that we're in a massive man made climactic shift but we're not even outside the boundaries of what we have regularly seen in the past, when man made influences were not present. Kind of like making an argument about the massive effects of the steroid era in baseball if no one was actually hitting more home runs. MLB had a sudden statistical shift in home runs by a statistically significant number of players (i.e. the number of players to reach the 500 club jumped massively from like one every 10-12 years to 6 in 10 years) Until we're an outlier statistically, it's very very hard to make your case for causation or to make any case that there is a significant problem. I see your point on the analogy, but lumping all natural causes into one set so you can say that there are only two causes is also misleading. Even grouping all the things man is doing (methane from cows, deforestation, fossil fuels, hydrocarbons etc) doesn't do much to isolate the specific things that are really causing the problem if it even is a problem. I find it pretty disingenuous to make the argument that scientists "have something better to do..." seems like a convenient story. There are a lot of scientists writing a lot of peer reviewed papers on climate change and arguing they aren't pointing to humans as the primary cause of global warming is basically making my point. If the scientists aren't explicitly stating that the cause of global warming is primarily man made then the 97% graphic is purposely deceptive. You can't have it both ways. Do people who study lung cancer not point to cigarette smoking as a primary/significant cause? I'm going to a choose a random subset of those papers because reading hundreds of papers is more time than I have to commit to this but I find it a little suspect that 97% of all climatologist think we're the main cause or that the current state of affairs is indicative of a major problem. It's my gut feeling that if I choose 20 papers randomly and 3 or more of them don't explicitly state they feel anthropomorphic causes are the main cause of global warming then the 97% number is very suspect, I could do the probability of that happening but even without doing the math I know it's pretty small. I can also figure out what a statistically relvant sample size if I need to but I have a feeling if I read 20 of the papers I'll get very large delta from the 97%. Roy Spencer also dispute Gore and his man Hansen that global climate sensitivity is high (which is a big factor in the alarmist nature of the global warming message). Pointing to point 1 on that site (that you have apparently not read in any detail) is a red herring. My argument is not that there is no greenhouse effect, my argument is that there is very little evidence to suggest the change in CO2 created in the last 100 years is the significant factor in changes in climate. IPCC recently admitted that their earlier claims about the rate of global warming were grossly overstated. (alarmist sensationalism) they also admitted they can not explain the current plateau in temperatures and their models all predicted twice the change than we're experiencing. Basically admitting their models are not strong and their position is flawed all in one fell swoop. Additionally Spencer shreds the IPCC for using models that don't find natural causes because they are explicitly designed to search for man made causes. Kind of have to be careful who you're citing as a source for your position when the majority of what your source has to say massively supports my position. bakertrg wrote "I find it pretty disingenuous to make the argument that scientists "have something better to do..." seems like a convenient story." sorry, *I* have better things to do than attempt to discuss science with those that immediately accuse me of being disingenuous because they can't answer the point. Now if you feel that there is evidence that shows that the rise in CO2 has not resulted in an increase in temperature, then please present that evidence on the appropriate thread (this one is for discussion of the concensus, not the phsyical science). But please do so without the hyperbole, I am interested in science, I am not interested in rhetoric. composer you're equating two things that are not the same. No one credible is stating climate change is not happening, the quote you have regarding "global warming is a hoax" is in regard to the alarmist global warming mantra being pushed by Al Gore and the like. That it's a man made phenomenon (AGW if you will) and threatening to destroy the planet. So matural climate change is definitely happening the argument is are we expereincing potentially devestating global warming that is man made, irreversible and a serious threat to life as we know it. One of the confusing things on this subject is the interchanging of terms "global warming" and "climate change". I'm guilty of this myself, typically global warming or Anthropomorphic Global Warming (AGW) has a negative connotation and puts the cause of change squarely on man and typically makes the supposition that the change is massive and catostrophic. The IPCC is not convincingly unbiased, I have read much of what they have to say but they have been impugned on numerous fronts, not to mention they attempted to sweep data that undermines there arguments under the rug. That's not good science. "...how was temperature dropping in the early 20th century despite rising CO2 levels"
I assume you are not going to pretend that you were asking us to explain something which you believed to be false. Ergo you have claimed that temperatures have fallen over the early twenty first century. So, by what measure? I'll make it easy for you. In the upper left margin you will find a button labelled "trend calculator". Press it, and tell me which of the temperature records shows a negative trend in the 21st century. Tell me the data set, the start date and the trend. If you cannot find one, publicly admit that you have made a trivially false claim that was easy to check. You have in fact proved that your critical faculties work only one way in this debate. Admit that to yourself and you may have a chance of becoming genuinely skeptical. NOAA, HADCRUT4, & RSS. Start date 2001, end date 2014 all give neg trends. bakertrg - That's quite a Gish Gallop of disproven memes you've posted, and indicate that you have not been reading up on the topic. I would suggest looking through The Discovery of Global Warming by Spencer Weart, which is quite approachable. Long story short, if you are actually interested in the science, I suggest you read up. Your claims are seriously in error. If you are interested only in dismissing the conclusion that we're responsible for climate change (as hinted at by the amount of rhetoric in your posts) you're barking up the wrong tree. The overwhelming consensus on the topic is due to the overwhelming evidence supporting it, and reality cares not one whit about your preferred conclusions. bakertrg wrote the early 20th century, so I am assuming that Tom Curtis meant to issue his point with respect to that timeframe, and the change in centuries is inadvertent. But Tom can clarify if I'm wrong.